The Harry Potter series, which I started reading at age 18 when I lived in the US, allowed me to relive some of my childhood. I feel young and utterly cheerful when I read this series. It's such a wonderful world of magic that anyone, young and old, can enjoy. These books just bring me joy. A lot of it. And makes me feel like anything's possible 😉 I reread it regularly because they are just fantastic. After a very long period of not feeling any affinity with books, this series got me excited about reading itself again. Reading pages on end in one sitting. It had been years since I've felt like doing that. Having struggled with depression (as well as cyclothymia) multiple times from age 15 to 23, I read a lot of 'depression lit' to gain an understanding of what was happening to me. Prozac Nation hit me very hard. I still cry when I think about my reading experience. The author dealt with a lot more on top of depression, but I felt so, so understood and it actually helped me overcome some of the emotions I'd been dealing with. I felt supported somehow, a little less alone in the world. This book definitely changed my life. This book's apocalyptic plot hasn't so much changed my world, but it has made me feel more responsible for the world as an individual, making me feel more conscious about my place in the world as one of many – and that one person perhaps can't change the world, but can contribute, however little that is in the grand scale of things. I try not to over-consume, to support organic food and to consider the environment and nature when I make certain choices. The most recent read of all, this book about a woman who has managed to get herself out of a hairy situation (a marriage which wasn't healthy) with willpower, strength of character and optimism. Patricia is a wonderful woman, and an inspiration. To just keep trying, to let go, to allow yourself to start over fresh and to do something with ideas. 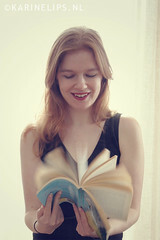 It's not just this project for me; books feature in my general photography and self-portraiture with some regularity. Books, my favorite props – in photos and life. Some photos I took today, featuring the book I'm currently reading: Dressing Up for the Carnival, by Carol Shields (and a lot of others in that stack, which almost tumbled down by the way). Hope you like these.